A few weeks back, I sat on the sunny and warm front porch of my daughter’s Alabama home. I’d come to visit during her pregnancy — a very happy development. While she worked on lesson plans for her theater students, I read Paul Gilding’s amazing book, The Great Disruption: Why the Climate Crisis Will Bring On the End of Shopping and the Birth of a New World. Gilding uses a ream of scientific evidence to demonstrate that there is simply no escaping a devastating environmental and economic crisis. It is on the way, maybe even here already. Some countries will end up underwater. Many species will die out. Millions of lives will be lost. But then … and this is the part I really like … we humans will discard the growth economy, and create instead “the happiness economy.” His words, I’m pleased to say! Indeed, Gilding says millions and millions of people all across the planet are already creating new systems and new ways of being for the post-growth economy. Since that’s what I’m trying to do with The Happiness Paradigm, I felt a great sense of belonging. Somehow, I managed to slide right past the “millions of lives lost” to the “happiness economy.” Well, why not? I can’t at this point save those lives. My energy can be better spent on helping to inflate the life raft of hope. On my way home, I went straight from the airport to the Unitarian Church of Montpelier for a workshop on “Climate Change and What You Can Do About It.” One of the speakers was Kathy Blume, a particularly bubbly environmental activist who ended her presentation by displaying a green heart decal. The decal, she explained, symbolized a commitment to adopting an approach of love as we face a future with enormous environmental, economic and social challenges. Gilding’s and Blume’s optimism definitely spoke to me — on some deep level, it seems. 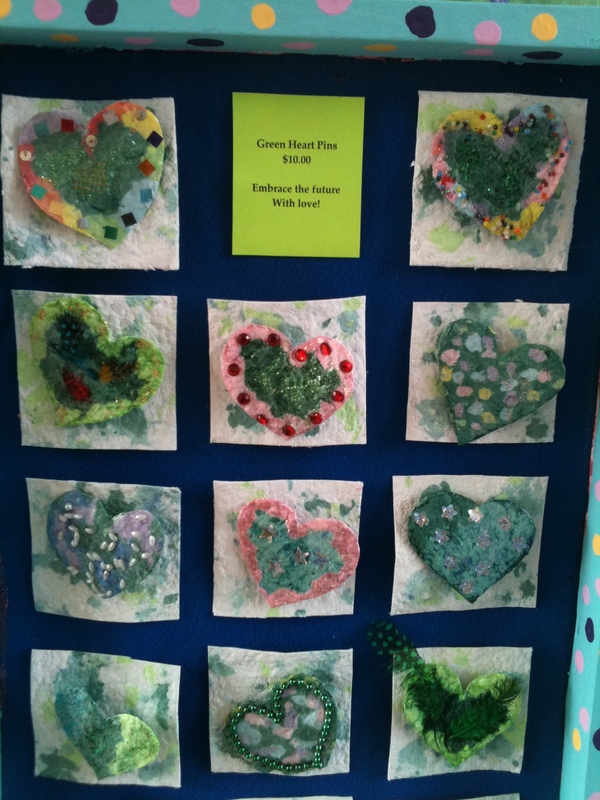 I woke up the next morning determined to make green heart pins from recycled paper and leftover glitter, beads and other fun items folks have been donating to me. Wearing these pins can be a very visible declaration of love — love for our beautiful planet, for the plants and animals and for all the wonderful humans who make us happy and also drive us crazy. So I got to work and created these pins. Whenever I sell one, I also explain what they symbolize. Maybe they’ll even catch on, like pink ribbons for breast cancer research. Maybe the pins will just result in a few smiles. Either result will be a good one. Who’s the messenger? What’s the message? Pictures, please! I want to see your green heart pins. Also, just want to say I LOVE you and am so privileged to have you in my life. Lovely Jeannette, thank you! You know your support has been so inspiring and helpful to me these last two years! As for pictures … Can you see the one I inserted? Are you asking for more?